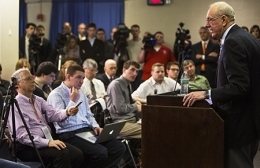 Syracuse Orange Coach Jim Boeheim answers questions from the media during a press conference in the Carrier Dome Thursday morning regarding recent allegations from the NCAA. “I believe in what we are doing at Syracuse University and will continue to build on the great program we have established,” Boeheim said. Boeheim’s tactics and program were originally brought into question years ago, most notably in regards to the academic eligibility of former center Fab Melo, who was suspended in 2011 for academic violations. However, Boeheim defended Melo and said he, along with every other athlete the 39-year SU head coach has ever recruited, was academically eligible unless actions against the athlete were taken, like in Melo’s case. He went on to say that many of the allegations regarding Melo’s intellectual ability come from a more deeply-rooted, societal problem. “I think there is a little racism involved when talking about taking this guy or that guy. Should we not have someone here because he’s from a foreign country?” Boeheim asked. Even while defending his former big man, Boeheim accepted responsibility for each violation in the 94-page NCAA report, noting that as head coach he needed to know all the inner workings of the basketball program. Boeheim plans to stick around to see the appeals process through and, in a meeting with SU Chancellor Kent Svyerud, agreed to retire three seasons from now. It was the first time Boeheim formally declared any sort of retirement plan. As for the future of Syracuse basketball, Boeheim believes current assistant coach Mike Hopkins would be a good fit for the Orange, but reinforced that the decision is not his. With the future of the program up in the air, Boeheim did make one promise to his recruits. “You only need to listen to me for three years,” Boeheim said.